It wasn’t that many years ago that our choices for Asian cuisine were quite limited here in Salem. We had Polynesian and maybe a little Schezuan and that was all. Dave Wong ruled the roost on Loring Avenue, the Waikiki dominated Bridge Street, and the Tiki Kai stood tall up on Highland Avenue. Those three and a variety of smaller take-out joints basically offered us the same menu with a few variations. Times have changed and for the better. While some of the old and dependable Chinese style options remain, we now can choose from a wider variety of Asian options. 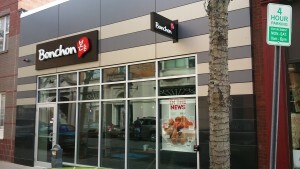 Bonchon at 299 Essex Street, next door to the old Jerry’s, one of the more recent eateries to open in Salem is the first to specialize in Korean cuisine. 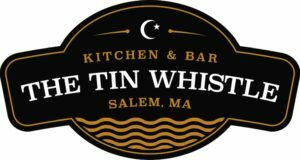 We had the chance to sample their offerings a couple of months back when they first opened. Our preference for a review however is to give a place some time to work out the bugs. After all, every business needs time to train cooks and wait staff and to fine tune their processes. We visited last week for lunch. There were three customers already seated in the rectangular and well lit dining room on our arrival. One father sat with is daughter at a table along the wall and a single gentleman was eating at the long bar. We were greeted promptly and allowed to select a table for two right in the front window. Looking at the two -sided menu we chose the Lunch Specials. Initially we were disappointed to see that the Japchae, which is a dish with noodles and vegetables was not available. We moved on however, hunger was the rule, not pickiness. The waiter had already provided us with water and chopsticks by the time we selected the mixed, bone-in chicken wings with eight pieces for $8.95. Strips are available for those who prefer no bones at all. We feel that the flavor is better when the meat is on the bone. 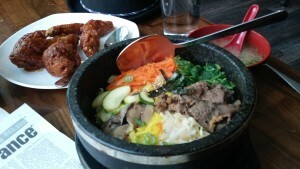 The Bibimbap at $10.95 was a selection also. This dish is warm white rice mixed with an egg as a bed, topped with seasoned and sautéed vegetables and chili pepper paste. This Bonchon version also comes with mushrooms, sprouts, zucchini, seaweed, carrot, scallions, and spinach, with a marinated and seasoned beef called bulgogi. chosen for American tastes. 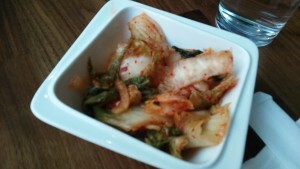 We like our kimchi to be a bit stronger in both aroma and taste. The wings were next and we found them meaty and quite tasty. 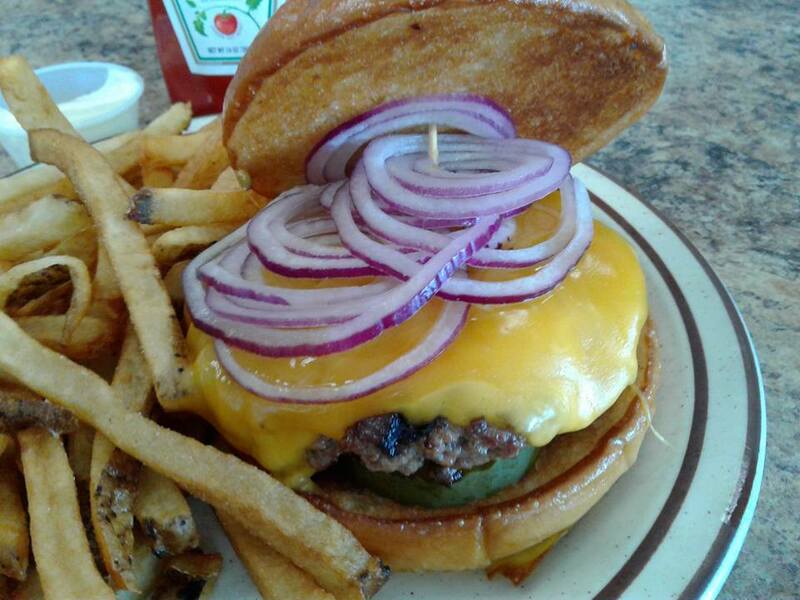 The sauce is not sloppy at all so you won’t go through a bunch of napkins. The spice level was medium, but it is of the type that builds as it goes along and then lingers on the tongue and lips for a period of time. There is also an underlying sweetness to the sauce that we found very pleasant. Now to the Bibimbap. 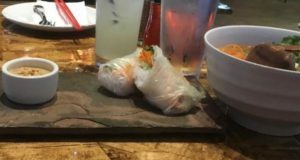 It came out in a hot steel bowl and the food itself was steaming. You may want to give it a moment to cool. We took the time to move the veggies around in order to see the actual layering of the components. The rice and egg at the bottom stick to the bowl and the rice is browned underneath from the heat. All of the other ingredients are sectioned nicely on the top. The presentation was excellent with wonderful coloring from the vegetables. This dish wa s the highlight of the meal by far. The spicing of the bulgogi was quite a bit more peppery than either the kimchi or the wings. It hit a bit faster, a bit stronger, and was much closer to what we like in hot and spicy dishes. The vegetables were sautéed very nicely and the rice added a a little weight to the meal. 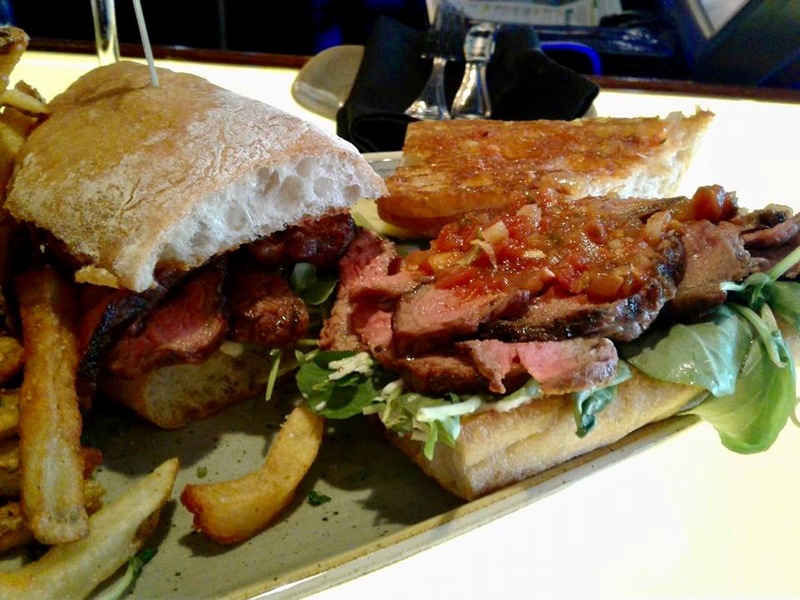 The beef was tender, flavorful and easy to chew. The small bowl of miso soup that came with all of the above was a nice addition to the meal. That and the fact that the waiter kept us well watered just added to an overall good experience. 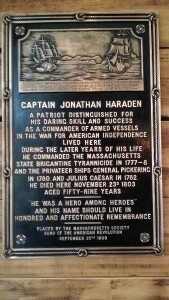 Try Bonchon out for yourself and be sure to check out the Captain Jonathan Hardaden plaque hanging just inside the entrance.